In former times, the Roman Catholic Church of St. Anne would have been an impressive building on the Tluste skyline, rivalling the beauty of its Greek Catholic counterpart further down the road. As seen this photo likely taken about 1928, its most distinguishing feature was a tapered steeple that lent it a certain charm. 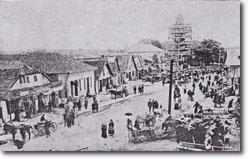 An image probably dating from around 1912 captures the bell tower ( long since destroyed) that once stood more or less in front of the main entrance to the church. Long before then, the church had a rather varied history. It apparently began its life as one of Tluste’s forts, dating from around the sixteenth century. Galicia was endowed with a large number of castle-forts at that time. In fact, they were in such close proximity to one another that when danger was imminent neighbours could be alerted by way of a warning signal. Tluste is said to have played an important role in this regard, as a protective buffer for the nearby towns of Czerwonogrod and Jaslowiec, 7 km and 28 km distant, respectively. Roughly rectangular in shape, the fort was rebuilt several times over the centuries. By the early twentieth century, the building was already being used as a Roman Catholic church, although period photos reveal the design to be much simpler. The ancient gates to Tluste were located near the ancient fort, but they were ruined by the Russians during the First World War. 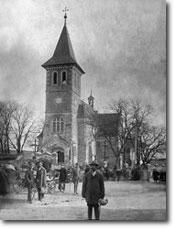 Evidently, plans were already afoot as early as 1902 to transform the existing church into a much grander edifice. 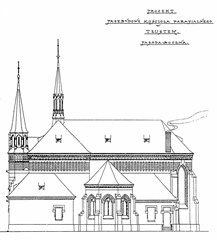 In May of that year, architect Teodor Talowski from Krakow made a number of sketches of his proposed design for the new church (pictured below). His plan was not chosen, however, and it was left to Jan Zubrzycki – architect of the Greek Catholic church – to prepare the design that was ultimately realised. For the time being, it is not known precisely when reconstruction began. The photo, opposite, of a streetscene looking towards the south, reveals the construction nearing completion, with the new steeple still entirely surrounded by scaffolding. The work is known to have been completed some time before 1915 since the new steeple appears in another photo taken around 1914. Another perspective from across the pond, taken in 1939, is the only photo that captures both the Roman Catholic and Greek Catholic churches together, in their prime. 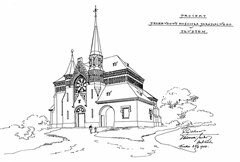 In the absence of copies of the original plans for the Roman Catholic church, one can only deduce the height of its steeple by comparing it to the known height of the Greek Catholic church. 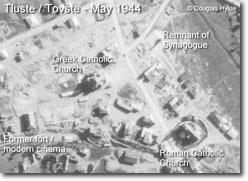 A comparison of shadows in an aerial photograph, below, taken May 1944 reveals that the former was only about two meters shorter than the height of the cupola on the Greek Catholic church – that is to say, roughly 26 m high. This photograph is probably one of the last in existence showing the church steeple intact, for later that year it was destroyed by the Bolsheviks under the order of the head of the district. Before the decade was out, the building had found a new purpose in life, one that it would retain for decades to come, after the Russians transformed it into a so-called ‘House of Culture’. In the late 1990s, during the course of work on a gas pipeline, the remnant of a tunnel was discovered leading from the former fort/church to another of Tluste’s ancient forts – today a recreation hall -- located about 225m away. The tunnel was not excavated, but one can discern part of it today, as a depression in the earth. The building was reopened as a church around 2000. A religious icon, in the form of a wooden statue, that had been kept in the museum for many years after the church’s post-war destruction, was finally returned to its rightful place. 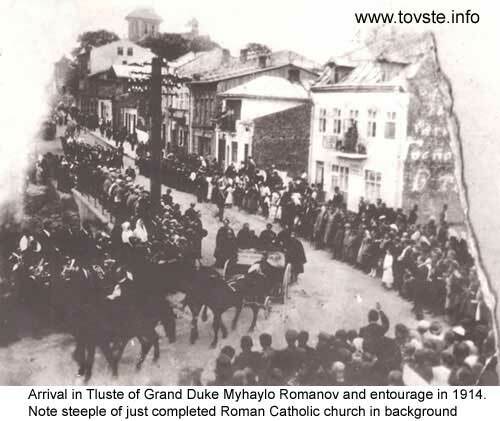 Today, not only do people of Polish ethnicity go to the weekly mass; it is said that townspeople of Ukrainian descent also attend out of interest in order to observe a service that is different from their own. Sadly, what remains of the modern Roman Catholic church lacks the character of its previous incarnation, although attempts have begun to restore it, beginning with a new roof. The current restoration project for St. Anne church has been financed by Poles living abroad with connections to Tovste, and by local residents. There are plans to rebuild the missing tower when resources permit. Only then will the original design of Jan Zubrzycki be returned to its former glory.